My friend Joel loves pigs. That’s probably putting it a little strong. Joel respects pigs and believes they’re too intelligent to eat. He refuses to eat pork products. A life without bacon isn’t something I’m ready to pursue, but I’ll grant that our porcine cousins do have a reputation for braininess. The story of Tom and DJ is a story about animal intelligence. It’s a story of animals making up games among themselves and having fun, even between different species. And most importantly, they do it on their own without human direction or prodding. The Dragonwood Farm link led me to Shepherd’s Green Sanctuary, a non-profit that “exists to provide rescue, lifetime care and other aid and assistance to abandoned, abused, neglected, homeless and otherwise endangered pigs.” A shelter for pigs? I never knew such a thing existed. There’s a huge list of pigs, many of which have mini-biographies. This site is like some sort of strange obsession, but I love it. There are 8 reader responses to "Pig Sanctuary". Actually, there are many, many shelters for pigs. (Do a quick Google for “pig sanctuary”!) It’s partly as a result of factory farming, where as you know they are treated horribly, and also due to the potbellied pig fad of the early 90’s. Everybody was getting potbellied pigs under the illusion that they were easy to care for. (They’re not HARD to care for, necessarily, but they aren’t the same as cats or dogs.) Additionally, scammers were breeding potbellies with larger pigs and then selling the babies as true potbellied pigs; when said piglets grew (and kept growing, sometimes 200 pounds past their promised weight) many people couldn’t handle them anymore. My understanding is that this is still going on to some degree, hence the proliferation of pig sanctuaries. Also, I have not seen this site before and it’s very entertaining! Thanks for suggesting it! they even have their own store in seattle, with proceeds going to the sanctuary. 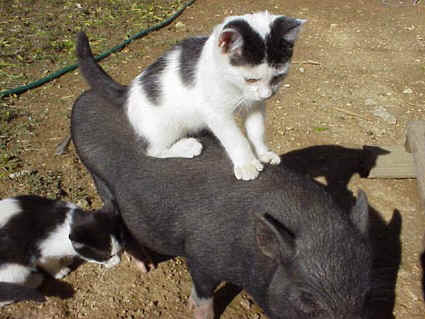 How can you be immersed the in the topic of animal intelligence, featuring remarkable tidbits like the story here of this cat and this pig and at the same time find ‘life without bacon’ incomprehensible. This is that ‘moral schizophrenia’ Gary Francione writes about. It’s also a bit on the dipshitty side to be honest. I totally agree with ‘pf’. How can you have this site and eat pigs? Come on! I disagree with Chris and pf. Cognitive dissonance is perfectly excusable, and a respect and acknowledgment of animals and their intelligence does not mean that one should be vegetarian. Perhaps it is hypocritical to a disgusting degree, but whilst I respect, like and even admire many (if not all) animals — I don’t think twice about picking up a packaged version of them in the supermarket. ‘Moral schizophrenia’ and hypocrisy is something we are all guilty of to some degree. I could not help but coment on the Moral schizophrenia thing. What a joke. Don’t let slack jawed mentality with spell check change your outlook on animals. They are just that, animals. It takes a strong person to hand raise a pig then lead him to slaughter and enjoy the sweetness of the meat. I have never tasted better, than those I have raised myself. Keep up the good work. I completely agree with pf and Chris. I was VERY surprised when I read you still eat pigs! You lost credibility with me.